Recently we worked with Panache to publish some of our work in a collaborative book showcasing home designs throughout the Pacific Northwest. “Pacific Northwest Homes” is full of amazing projects from numerous architects, interior designers, and contractors from Oregon, Washington, Idaho, Montana and the British Columbia. Hard copies will be available early next year, but we’d like to share a two-part digital version here: https://inspired.uberflip.com/i/860803-pacific-northwest-…/0? Jump to our section of the book by clicking this link: https://inspired.uberflip.com/i/860776-pacific-northwes…/129? Jake Weber has recently been promoted to an Associate and shareholder with Giulietti | Schouten AIA Architects in Portland. Jake recently became a licensed architect in the State of Oregon and has been with the firm since 2013. He is a graduate of the University of Oregon School of Architecture, and regularly serves as a panelist at studio reviews and assists in experimental spatial studies. He is currently managing the design development and construction of various residential and commercial projects. This custom designed McMinnville home was recently featured in the Fall issue of Portrait Magazine! Volume No. 32 featuring this G|SA project is on stands now. Check out the spreads below. The Road’s End Beach House was recently featured in the Fall issue of Gray Magazine! The magazine is geared towards design in the Pacific Northwest. Issue No. 24 featuring this G|SA project is on stands now. Check out the spreads below. In the last couple of months G/S has received some excellent publicity. Luxe Magazine, in its fall issue, featured our design for the sleek modern interior of an urban penthouse in Portland’s Pearl District. 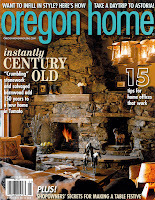 Shortly following this publication, the recently completed Cody Cabin, a rustic old-west influenced home, was featured as the cover story for Oregon Home magazine. The article was the perfect bookend to a unique project and testament to a great client-architect relationship with homeowner Karin Cody.